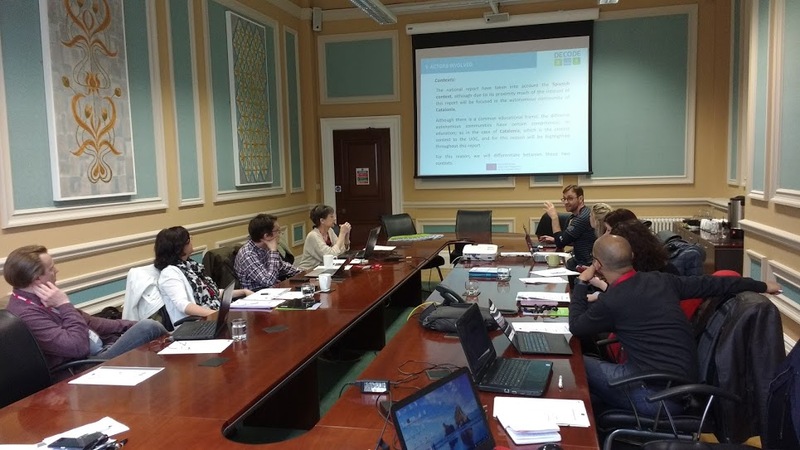 On the 8th and 9th June, the members of Edul@b Marc Romero and Carles Bruguera travelled to Bradford to attend the second meeting between partners of the European project Erasmus + DECODE (DEvelop CoMPetences in Digital Era). This project also involves the researchers of Edul@b Montse Guitert and Teresa Romeu. The encounter was distributed in two days. The first of them was an internal meeting between project partners from universities and institutions from 4 different countries: Italy, United Kingdom, Romania, Finland and Spain. In the first part of this meeting each partner presented the results of IO2, in which they presented a national research report on “Innovative models, methods and training tools for teachers in the digital age”. Subsequently working groups were created and the common points and particularities of each country were observed. On the second day, the project members participated in the Multiplier Event held at the headquarters of Aspire Igen, which also involved professionals from the education sector in the Bradford region. In this event, were presented the results that the project had generated so far and a roundtable with local professionals took place. In June, IO3 will start, which consists on the elaboration of a series of guidelines to guarantee the quality in the process of integration of the ICT tools in the teaching-learning process. You can find all the project information on the DECODE website and the Facebook page.